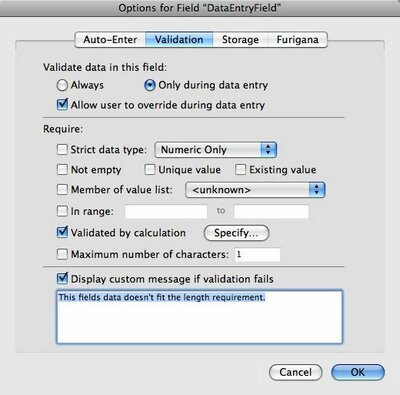 I liked your blog on FileMaker Validation. I see that you can validate the maximum number of characters. What I am struggling with though, is how to validate that a field has a specific number of characters. My field HAS to be numeric, and 9 digits exactly. Cannot work out how to do it! Well, you are very close. You will want to validate via a calculated value. 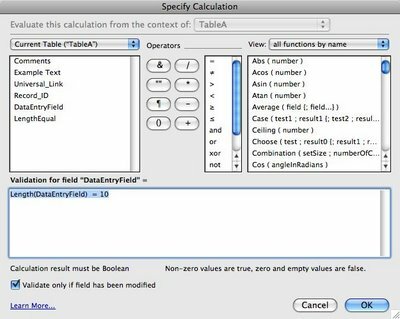 You can set the calculation to determine the data entry length by using the Length function. Here you can see the validation tab selected in the the field options dialog box. You can see the check next to the Validation By Calculation option and the custom message when the validation fails. Here you can see the calculation within that confirms that a field (in this case called DataEntryField) is equal to 10.